We offer professional conservatorial quality oil painting restoration and cleaning services. 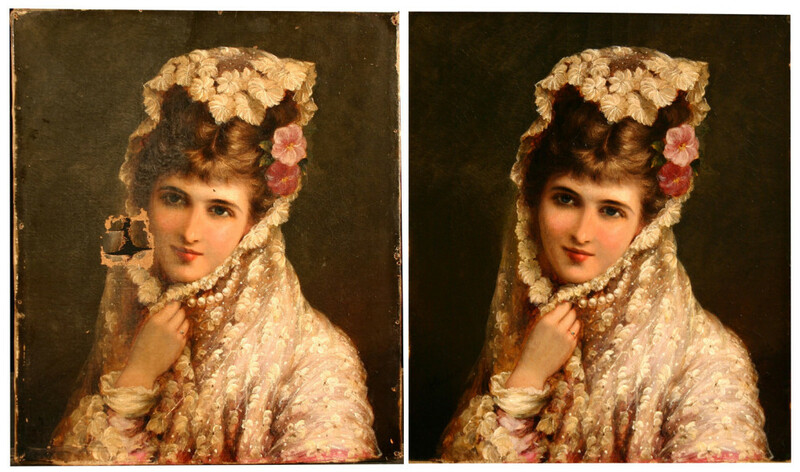 Oil painting restoration can bring a prized family heirloom back to its original beauty, or prepare a painting to be sold. A painting’s surface can be dimmed by environmental factors like water damage and smoke or dirt buildup and our skilled conservators can also expertly tackle more significant damage like rips or tears. When should a painting be cleaned or restored? 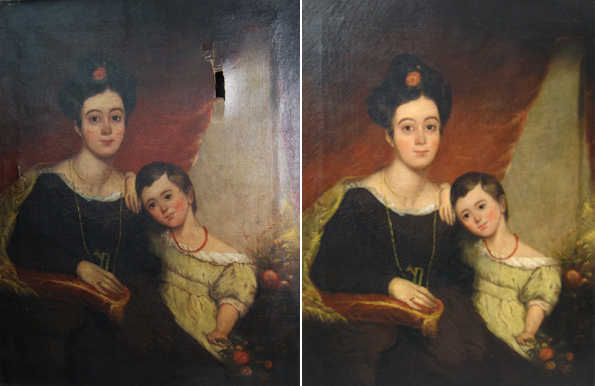 We can help you restore a painting that has emotional or sentimental value, and we can also help bring a painting back to life so it can be sold. Selling your painting is not a requirement for taking advantage of our professional team and competitive rates. A fine painting by a well-listed artist or a talented amateur can sometimes have its value enhanced by a professional cleaning or restoration. A well-cleaned or restored painting will often perform better in the open market than a damaged or dirty painting. A few years ago, we were asked down to a family home in Guilderland to look at an oil painting. The couple who owned the very large painting had received it when a distant relative died 30 years before; the painting was taken to the garage, propped behind an old refrigerator, and forgotten. When we first saw it, the painting was covered in decades of dust and grime and badly in need of a cleaning, but it was still identifiable as a superb Hudson River School painting by the well-regarded artist Alfred Thompson Bricher. Our conservation team properly cleaned and conserved the painting, and we sold it at auction for the family, bringing them $130,000. Below, you can see the amazing transformation from before the restoration to after. Sometimes the cost of cleaning a painting may be higher than its fair market value. However, many families are interested in restoring an heirloom to its original beauty for their own enjoyment. The sentimental value of a painting can be more important than any profit. Ultimately, it is up to the customer to decide if its emotional value outweighs the cost of cleaning and restoring. What is the process of having your painting evaluated for restoration? First, we will set up an appointment for you to bring your oil painting to one of our offices. (An appointment can be set up by calling our office at 518-587-8787.) Mr. Lawson will examine the painting and discuss with you the potential treatments the painting might require: cleaning, stabilization, re-framing, repair, etc. You will then receive an estimate for the cost of services. Our conservatorial team provides exceptional results, a quick turnaround time, and competitive prices. How much does it cost to clean or restore a painting? The short answer is: it depends on exactly what kind of work needs to be done. Without seeing the painting in person, it’s difficult to evaluate this. Your estimate will include the projected cost of restoration as well as the projected length of time the restoration will require. Can you also restore prints/watercolor paintings/sculpture/porcelain? We primarily focus on cleaning and restoring oil paintings, but sometimes we can help with prints, watercolor paintings, or other works on paper. We can always give you a reliable referral if we can’t help you ourselves. Would you like to learn more about having your oil painting cleaned or restored? Email us at marklawsonantiques@gmail.com or call us directly at (518) 587-8787. Hi Maxine, Sorry we didn’t see your comment sooner! It got caught in the spam filter. Feel free to email us at marklawsonantiques@gmail.com; we would be happy to help if we can! Hello. Is it wise to repair an oil painting before getting it appraised? Or should I get it appraised with the small damage, and then get it fixed and re-appraised. Thanks for advise. Generally speaking, the best way to proceed would be to have the painting looked at by an appraiser before repairing it. The appraiser should be able to determine the painting’s current value, and also determine whether a repair would add significant value. Sometimes a repair may cost more than the painting is worth, or may not significantly elevate the painting’s value. These are all important factors for if you’re interested in restoring the painting in order to sell it. If you simply want to repair the painting for your own pleasure and then have an insurance or estate appraisal done for your own records, it becomes more of a personal decision than a cost-benefit situation. An appraiser with experience in painting restoration should still be able to help you make this decision by determining the value of the painting and an estimated cost of the repair. There are a lot of different factors when it comes to painting restoration and subsequent sale or appraisal. I hope this information is helpful!